With winter quickly on its way, making sure your deck can withstand the harsh weather should be a top priority. 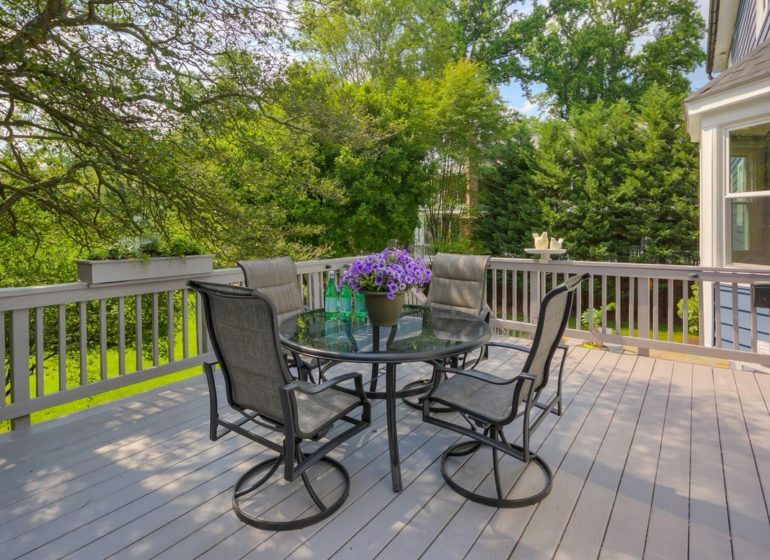 Since a deck adds significant value to your home, it’s important to make sure that value does not diminish over time. A professional custom deck installation expert can help ensure that your deck is strong enough to handle the elements throughout each season and maintains it original beauty. At HB Home Services, Our quality home improvement services include custom deck renovations to homes in the Northern VA area. With our team of experienced deck-building carpenters, you can be reassured your deck is constructed with materials of the highest quality and that it’s built strictly to code. We want you to be aware of the proper techniques to keep your deck’s appearance presentable and have provided three tips below to help you do so. When it comes to restoring a deck, the first thing that comes to mind is replacing any damaged or warped boards. Not only does this improve the look of the deck, but also improves the safety for the homeowner or visitors walking along it. Next task on the list would be to refinish the wood. Re-staining or painting your deck will provide a protective layer against the elements, which will make your deck longer-lasting and looking brand new. In addition to this, if you have any lighting fixtures built into your deck design, you may want to make sure they are operating properly and that the acrylic or glass panels are not cracked. If gone untreated, snow, water, and ice can penetrate the light housing causing damage to the unit as a whole. If you have a second story deck connected to your home, one thing you can do before winter arrives is construct a roof under the deck. This design is useful to catch water and redirect it away from the patio area. The roof will allow you to increase your living space by adding a second living area underneath it. It could also be used as additional storage, which will be kept out of a majority of the elements. This type of upgrade is relatively inexpensive yet provides extensive value to your home. One of the most common areas to rot away first are joint locations. Over time, these areas like to trap in water and debris, which eat away at the wood sooner than expected. This is why it is always important to check these areas each season. Also, make note of any weak railings because not only does it create an eye sore, but it can jeopardize the rigidity of the structure. Another aspect that needs to be checked before and after winter is the support beam stability. This includes making sure the ledger board is properly fastened and secured. If the ledger is unsecure, the additional weight from substantial snowfall can cause the deck to collapse under the pressure, which is the very last thing you want as a homeowner. Have HB Home Services Renovate your Deck Today! Don’t try to take on deck reconstruction projects on your own. Make your deck renovation installation process easy and work with a professional home improvement specialist. Let HB Home Services custom deck construction professionals in Northern VA can handle your deck’s entire design and construction so you don’t have to. We make sure to stay within your budget while providing the best deck construction services you need. If you’re interested in protecting your deck to prepare for winter, contact us at (703)-764-0498 for a free estimate today!